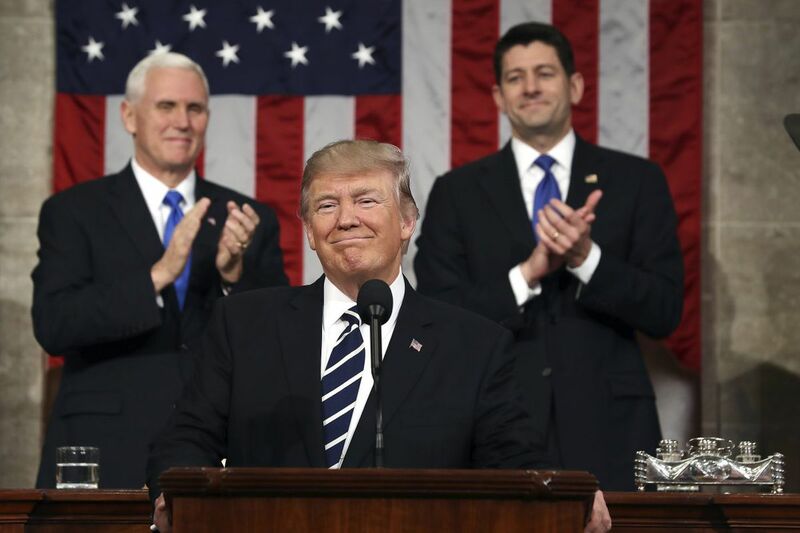 Vice President Mike Pence (L) and Speaker of the House Paul Ryan (R) applaud as US President Donald J. Trump (C) arrives to deliver his first address to a joint session of Congress from the floor of the House of Representatives in 2017. Traditionally, the first address to a joint session of Congress by a newly-elected president is not referred to as a State of the Union. To help you pay extra-close attention to the language of this speech, we've created this State of the Union-themed bingo card. Using very scientific methods (aka reading a lot of tweets and watching a lot of old speeches), we've determined that Trump may or may not say some of these words. Your prize for playing along? The pride of being one of the very best bingo players America has ever seen. It's incredible! You'll have made bingo great again! And that ain't fake news.